It was with great regret that the club learned of the passing of Albert O’Dwyer. 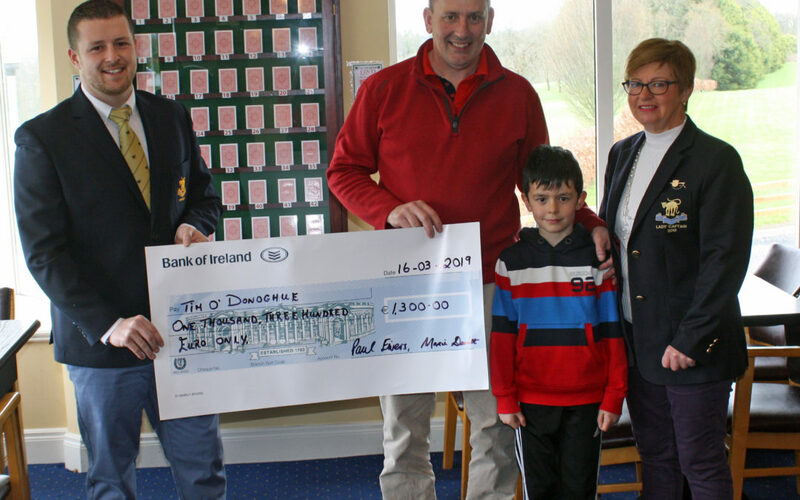 He was a founder member, past President and Honorary Member of Cahir Park Golf Club. He will be reposing at Costigan’s Funeral Home, Cahir on Tuesday evening, March 19th from 4 pm. Removal at 7 pm to the Church of the Assumption, Kilmoyler at 7.30pm. Funeral Mass on Wednesday at 11.30 am with burial afterwards in Killaldriffe Cemetery. The golf course will remain closed on Wednesday morning until 2 pm. We will hold a ladies open stableford competition on March 28th. This competition is kindly sponsored by Healthy House Cahir. Timesheet is available in the PRO shop. Our Cahir Park Golf Club 2019 Fixtures Booklet is available from David Ryan’s PGA Professional Shop or in the clubhouse bar. Thank you to Ned Grant for sponsoring the booklet. The grand final is rescheduled for March 24th. We would like to thank all who entered and thanks once again to Murphy Fuels for their sponsorship. As mentioned in last week’s notes Keith McGuire is now managing the Bar and Restaurant at our club. Grab lunch or a meal before or after your golf and show your support to Keith. The Bar and Restaurant are open to the public. In the heart of the golden vale our meeting room, which is available for rent makes an ideal venue. Free Wi-Fi and parking. A gentle reminder that membership is now overdue. Only paid up member can participate on teams. Also last chance to join Club Insurance Policy which covers loss of any golf equipment.